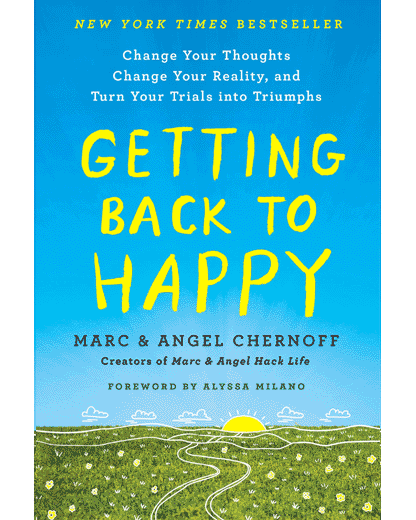 Marc & Angel – I am a daily reader and you both have inspired and help change my thought process and actions towards life. I wanted to thank you particularly for this blog and sharing some of your most intimate failures with me. I appreciate it enormously and it makes you both more relate-able as people and not just as the “writers of the blog.” Thanks for all you do, you are more helpful than you realize. Such inspiration. Most times when I read your blog, it is common sense that you do not see in the world today. Today’s is very compelling to listen to. Most times you “see” what you want and when you do not get it, it’s the end of the world. If you stay grounded and actually look around, you will see where you should be headed. Thank You for sharing the insight it is a wonderful thing to read. Reading your posts each time is always like source of fuel for my happiness and my journey to the top. I love your guys’ work here so much, now i know how ‘Marc and Angel’ came about and how you met. I really liked this one and could add a number of similar entries – so true! Another great post Marc! I really enjoyed reading it. It is always in failure that we move up to our own happiness. There will always be blessings in disguise that will actually lead us to great things in our life. I’m glad that those failures that you had leads you to a beautiful and happy life sharing your thoughts and experiences to the people reading your blog and I’m one of them. I have been starting every day with a dose of your blog. It is amazing! I’m sure this article touched many people this morning, but I believe it was specifically for me! This morning, I woke up to unusual feelings and thoughts of fear and failure. And as I was making my declaration for combat the feelings, my ‘new email’ beep on my phone (which is strange, b/c I usually put my phone on silent when I go to bed…or put it in another room), and I read this article and almost jumped out of my skin! #s 2 and 3 are almost EXACTLY the experiences I had that were dealing with me this morning! Thank you so much for sharing your story. I am truly and inspired not to quit, and to keep moving forward no matter what life throws my way! It feels a bit weird to be saying this, but…Marc, I’m so glad you got rejected by all those universities, and that Angel was fired from her job… their loss, our gain! Super story, and right on the money. I always told my two wonderful daughters – Michelle & Heidi – that most folks in life will only knock on 20 doors of opportunity and then (with no one saying YES) give up. I told them if you REALLY wanted what you said you did, and if you refused to take NO as any sort of answer, you’d knock on the 21st door – and that would be THE one that opened. I decided in 1991 to get on LA radio with an offbeat travel show. Everyone told me it was impossible, LA far too competitive. I was on KABC, KKGO, KMZT & KNX for a very successful 16 years total. Never give in, never give up. Persistence DOES work! How much do YOU really want what you say you do? It is always a good idea to follow your passion. But sometimes people don’t understand which way they should go. This is why they make mistakes. Now if there is someone to tell them what is wrong and what is right, this special person brings a big difference. You are right and surely the story of your life is quite inspiring. I would love to recommend your site to all of my Facebook friends. I understand, it must be your passion. Otherwise, it is always possible to write every article with your heart and soul. I read almost all posts you right. It feels like when you write you put everything in it and take so much care to organize your thoughts. Love your blog, recommended by a friend and you have been helping me with my life challenges. Read nearly everyday after an extreme move away from Family and friends. So it’s as if your blog is my new friendly conversation. Thank you!! This is just AWESOME… Couldn’t be any clearer. Thanks Marc and Angel. Life seems more manageable since I start reading your posts. I’ve been reading your blog for about a year now. It’s made a lot of difference in my life. Very often you say things that help me, or remind me of something I have forgotten. Everything you have written has applied to my life in some at least tangential way. This fits like a glove! I got pregnant in high school, my senior year, of all the years, and was forced to abandon my dreams of leaving my hometown for the college I have longed for all of my life (UCLA). Quite frankly, with all the odds stacked against me and my baby in arms, everyone doubted that I would finish high school, much less pursue a higher education. Long story short – I graduated with my high school class. I got my BS in Accounting. My MBA this year. And am now working on my second Master degree – Masters of Accountancy. Had I not had my little baby when I did, I am not quite sure I would have had that same fire inside of me that kept me going forward and never allowed me to give up. You’re the best motivator. I love your articles and not only read them, but also spread them by forwarding them to my friends. These three stories are amazing and prove that the things that happen right now are necessary for your future if you take them as a chance. Spot on! When one door closes etc etc. Rather than seeing rejection as a bad thing I take it as an opportunity to figure out what I really want and am normally steered in the right direction. Your blog so useful, I just subscribed. Nice work! Nice one Marc. The Universe is benevolent, everything happens for a reason. If we can embrace what is and move forward life will just keep getting better. The energy we spend fretting delays or negates our possible bright future. Whoa… Deja vu. I, too, was rejected by my ‘main’ college choices and wound up at UCF on what seemed like a whim. I have heard ‘average at best’ used to describe various aspects of my creativity, but yet have I’ve made a heck of an award-winning career out of that so-called mediocrity. And then found myself writing a new chapter in life after a very public, disruptive ending. All of which have been lovely blessings. Cheers to your success, and thanks for the inspiration (and walk down memory lane). I cannot say how much this blog helped me today. A couple of hours back I gave a certification test and I failed. This test would help me find a career but unfortunately I didn’t get through. I put in so much effort and hard work aiming this test. I was very disappointed, sad, cried and lost all my hopes. I came back home and like everyday opened your website. After this blog, I’m now smiling and feeling positive that I have something else in reserve and that I should definitely continue forward n smiling. Thanks a ton. You really made me feel good after a long day. It’s really great to hear these inspiring stories from both of you. Your previous failures are really meant to motivate and enlighten the life of a lot of readers. I am honestly one of those who feel blessed by your creative and magnificent works. Thank you very much for being here for us. Both of you are heaven sent. Your blog has been my guiding light during my darkest days. I cant thank you enough. Keep on writing! thank you for this post. i am in a tremendously difficult spot in my life right now (lost hours at my job because of a coworker who decided to tell my boss i was considering a new job.. that fell through) and i have been desperately trying to tell myself that i am supposed to be here, that around the corner something is waiting for me. and although this post made me cry, it also has made me realize that i just need to shine on through. and that i am ok. thank you for reminding me of that. Sometimes, heck – all the time – the dots aren’t connected until later on. We live our lives either in action or inaction. Those are such great examples of how action breeds results even if we don’t know what those results will be! I think we so often just follow others leads when our lives would be so much happier if we took the initiative ourselves and “made waves” and discovered things. Never sit back and wait. This is just what I needed to read today. Yesterday, when it appeared, I was too busy, but today it makes so much sense. I love the part where you wrote that we just need to trust that the dots will connect sometime in the future. I am going to take that with me. Thank you!! Hi Marc and Angel. I am tewnty-one years old, and currently a college student. My step-father introduced me to this blog (found it originally on Stumble), and to tell you the least, this blog has helped me. I have had many difficulties in school, my family, and anxiety in general, but when this site pops up in front of me, life seems to make sense. You guys do a wonderful job in keeping my head above the water, and I’m sure that there are many more out there who feel the same. Your blog is one of a few seemingly small things that I’ve incorporated into my life — I read it everyday. You two have changed my life and my outlook and I am forever grateful. Don’t ever stop! I do so love your blog and today’s was something I so needed to hear. I’m wildly passionate about photography, mostly the beautiful outdoors and all the eye candy nature provides. I somehow want to share what makes me go “ahhhh and ooooo” with others through blogging. Taking that first step is scary and my subconscience seems to hide that desire to start a blog from me. I know I need to step out of my comfort zone and get going…take that first step! I have always heard that LEADERS are born and I would say this for you guys but in with a slightest change, “You guys are born for Writing”. There is a mix of inspiration, motivation, support, love in your writing and above all we get a reasoon to stop and think about what we are doing in our lives. Thank you for being one of the reason why I have changed. Just the right message for the day. I was seriously thinking of throwing away my struggling start-up, when I see this today. Thanks – It only tells me to pursue further and not give up at this age. Its true that you have to trust your faith and karma. I am one of your silent readers! I glance here now and then and have always found inspiring articles here. This article of yours was one that moved me the most, perhaps it is the personal nature of this article. I used to think that I had gotten “off track” in my life due to some failed relationships etc. However, now I have learnt so much due to being off-track that I am actually thankful! I have just read an article about an exceptional couple’s struggles. Thank you for sharing. I can only guess that your writings have inspired a lot of people including myself. Thank you so much Marc and Angel. I love this story and I love your blog. I’m a 65 year old retired guy who is finally able to be retired. For so many years I have worked for someone else making them rich. Now I have decided to enjoy life and hopefully I can pass on great information like your blog to others. I hope you don’t mind, I added a link to your blog on my website. Your blog should be shared with the world. God Bless you both. Thanks. I needed this today more than I can ever tell you. Thank you soooooooooo much for this article and many others you have written. I have been in a very deep depression the past two weeks re: a personal failure and I just haven’t been able to see any light even with my friends encouragement. This article really helped me put things back into perspective again and try to refocus to move forward. I appreciate your blogs more than you can imagine. Just what I needed to hear right at this moment. Thank you so much, for your kindness and willingness to share.